Hoffman Landscape LLC is a Landscaping Contractor serving Racine, Milwaukee, Waukesha, Kenosha, and Washington Counties. We are certified Women-Owned Business Enterprise (WBE) through State of Wisconsin, Department of Commerce. We also hold a Disadvantage Business Enterprise Certification (DBE) from the Wisconsin Department of Transportation. We are well established full service Landscape Construction and Maintenance Company and aim to maintain a reputation of trusted advice, quality of materials and excellence of service. We welcome the opportunity to create a working relationship with our clients for years to come. Please read more about our company in our NEWSROOM or follow us on the social media channels. 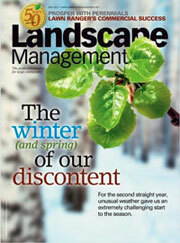 As featured in Landscape Management Magazine. Racine • Milwaukee • Waukesha • Kenosha • Washington County.